MineralPro’s Whole House Cartridge Systems comes complete with a 10” Big Blue filter housing, a heavy duty metal mounting bracket with screws, a removal wrench for filter replacements, and a 10 micron carbon-impregnated non-cellulose media that is resistant to bacterial attack allowing it to be used for municipal and non-chlorinated water applications. Pleats provide additional surface area for high dirtloading capacity, while maintaining minimal pressure drop. 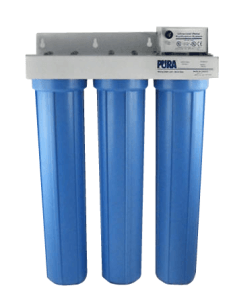 This combination of a pleated polyester media and carbon filtration produces an outstanding filter cartridge with extended service life. 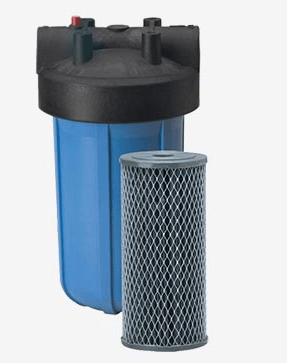 The filter cartridge is a 10 micron carbon-impregnated non-cellulose media that is resistant to bacterial attack allowing it to be used for municipal and non-chlorinated water applications. Pleats provide additional surface area for high dirtloading capacity, while maintaining minimal pressure drop. This combination of a pleated polyester media and carbon filtration produces an outstanding filter cartridge with extended service life.